Dash cameras are now being used by thousands of motorists in Australia to record vital video evidence in the event of an unfortunate accident. Auto BlackBox Australia has been supplying the best quality brands since 2009 and continues to research and test different products ensuring our customers and retailers get the best products on the market. Car dash cameras also known as a car black box is a video recording device that mounts on your cars windscreen and records constant video & audio as well as other information such as speed, location date & time to provide evidence in the event of an accident. They come in all different shapes, sizes and qualities and can essentially be installed by almost any one as they only require power from the cars cigarette lighter to work, however drivers can also hardwired these into the vehicle to conceal cords. Dash cameras provide an essential service that conventional cameras such as the one on your smart-phone or sports cams can't match. Our systems use built-in features such as 'loop recording' which creates a constant cycle of files within the cameras storage that works by deleting old files to make room for new ones. This means the user doesn't need to worry about the sd card being full of data as the camera will automatically make room for new files by removing footage that is no longer needed. Auto BlackBox supply leading dash camera brands such as the BlackVue - offering the highest quality and most feature packed systems available in the world. These systems are available all over Australia from local suppliers. An experts dash cam recommendation. As discussed in more detail below, our guide for the best dash camera is the BlackVue DR750S-2CH which has the most features compared to any other dash cam on the market. You may ask yourself, why do I need a dash cam? There are many incidents on Australian roads, as unfortunate as they are, accidents do happen. Dashboard cameras record these and protect the driver from being accused of wrong doing that is not their own. Ken Olsen - road rage victim, is viciously attacked on Australian roads. Ken's experience one of the most well known examples of how important dash cams are in the event of road rage. 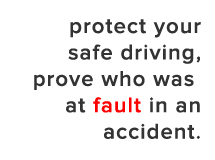 A driver decides to flee from an accident knowing he would be up for some costs. Video evidence helped this driver prove the damage to the car was not caused by him. ARE ALL DASH CAMS THE SAME? The purpose behind every dash cam is the same, however like many things they are available in different names, models, quality and for different prices. All features above are included in the top of the range cameras we sell. Our BlackVue cameras are the most popular brand in the Australian dash cam industry with more re-sellers than competing Korean brands in the similar price bracket. Car dash camera products for Australian drivers to record vital information for safety, insurance and defence purposes. Dash cameras are now becoming a necessity for drivers in Australia. A question commonly used, 'what is the best dash cam?' With so many cheap, expensive, bulky and discrete dash cameras being offered, we take the hard work out of testing the vast majority of these different brands. Our company specialises in dash camera technology, it is not just another category lost in a massive amount of products that we sell. 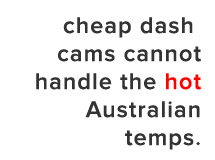 To firstly consider what makes the a good dash camera, one must assess what their requirements are, you may not want certain features however the most important feature to consider is the video quality and the cameras ability to handle the Australian heat. There is no point capturing driver's in the wrong if there the picture is poor and crucial details such as the license plate is not captured. After years in the dash cam industry - our highest regarded dash cams for quality, features and reliability are BlackVue cameras. A market leading dash cam with Full HD recording @ 60FPS, built-in WiFi for wireless viewing on smartphones or tablet devices and built-in GPS. The DR750S-1CH is a one of a kind system with unmatched commercial grade quality and reliability. Like the DR750S-1CH single channel model, the DR750S-2CH has built-in GPS and WiFi making it the only front & rear product on the market to offer these range of features. The DR750S-2CH system offers high quality 1080P front and back for ultimate recording. When purchasing a dash cam it is very important to make sure you get the backup support. Auto BlackBox cameras are not just another one of the many dash cams available 'online'. We distribute reputable dash cam products which are now available from over 100 stores Australia wide, this means customers can deal face to face with experienced and respected staff when purchasing a dash cam. Visit our dealer locator page to find a local Auto BlackBox supplier near you.